100% hand made in Accrington England by skilled ex Riley designers, machinists and ultimately installed with our skilled fitters. Our chief Snooker Table Technician designed and produced this impressive contemporary solid oak example above. These and other designs in our range cannot be matched in quality of build anywhere in the World. They will be crafted from scratch with kiln dry ed rough sawn hardwoods ordered from local specialist timber suppliers. Each piece will be machined and finished to exacting standards. Each of the snooker table legs will be hand machined individually. 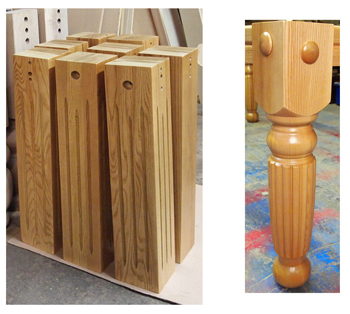 Table Legs can be either turned, tapered as above or square. You can have your table any colour or combination of colour you desire. One and three quarter inch thick 5 piece diamond bench precision ground Italian slate bed on the full size versions. Northern rubbers, ball runner, pocket nets and leathers fitted on all cushions. *All cushions and bed covered in the cloth of your choice. Steel block cushions, new steel friezes can be ordered and machined from our specialist engineering suppler if required. *Any cloth type and colour of your choice, see cloth information below. For normal use we would recommend the "Hainsworth Smart" range of wool napped cloth for durability. Built for you by the same personal that made Ronnie O Sullivan's personal solid walnut match table. Contact to discuss your requirements even if your room is under development. 20% deposit, Cash balance or bank transfer to be paid at point of installation and your satisfaction. For normal use we would recommend the "Hainsworth Smart" range of wool napped cloth for durability. "Cloth inofmation below"
100% UK manufactured in Accrington Lanc's. Outstanding quality, beautifully crafted using the know how and attention to detail you come to expect. According to our experienced table fitters ( All time served with apprenticeships at Riley Snooker when the manufacturing base was here in Accrington and Padiham) Hainsworth Smart and Strachan 6811 are very similar giving a hard wearing 5 - 7 yrs use. The Refurbishers have over 120 years experience between them in both technical design and 10 years experience in the manufacture of World Tournament Tables supplied to the World Snooker Association. 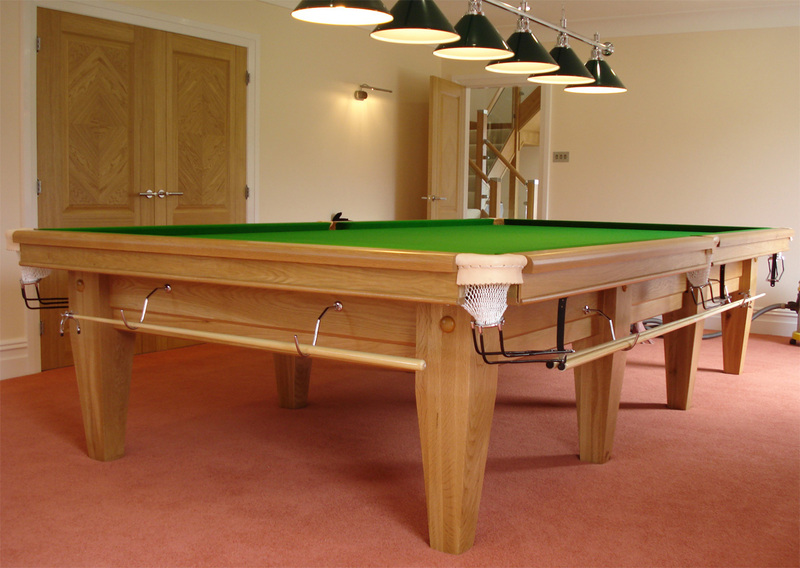 These tables have proved to be the first choice for the ultimate in cue sports.